Governor Andrew M. Cuomo today honored 40 police officers who made the ultimate sacrifice in service to communities across New York State. 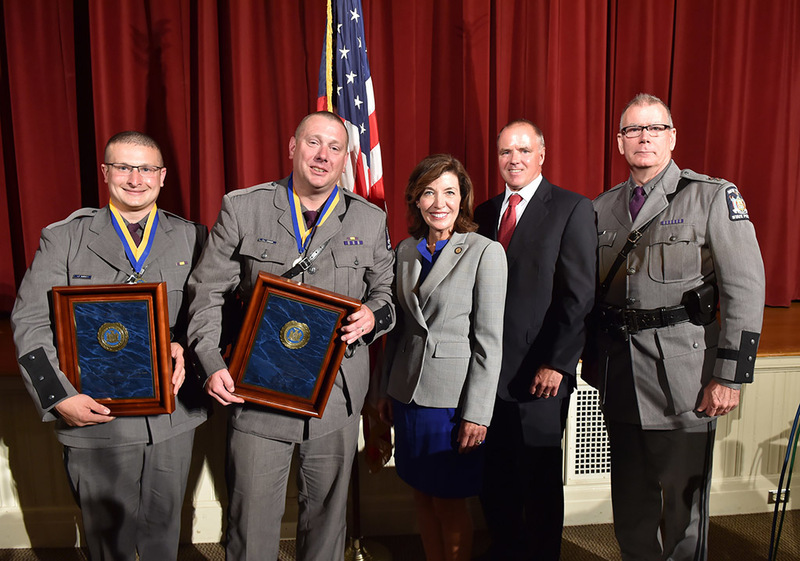 The officers, from five local and state law enforcement agencies, were recognized at New York State’s annual Police Officers’ Memorial Remembrance Ceremony. The names of the 40 men and women join others chiseled into the black granite memorial at the Empire State Plaza in Albany. The memorial includes 1,453 names of officers from 141 police agencies across the state and six federal agencies. "Each day, law enforcement officers selflessly put their lives on the line to protect the public," Governor Cuomo said. "Today, we honor the enduring legacy of those dedicated police officers who gave their lives to keep our communities safe and join in thanking their families for their bravery and service." 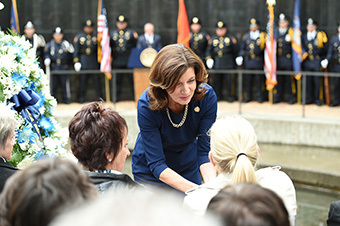 Lieutenant Governor Kathy Hochul spoke at the ceremony, which was attended by more than 500 people, including local, state and federal law enforcement professionals; elected officials; and family members of the deceased officers. The solemn service also drew many friends and colleagues of the fallen officers. 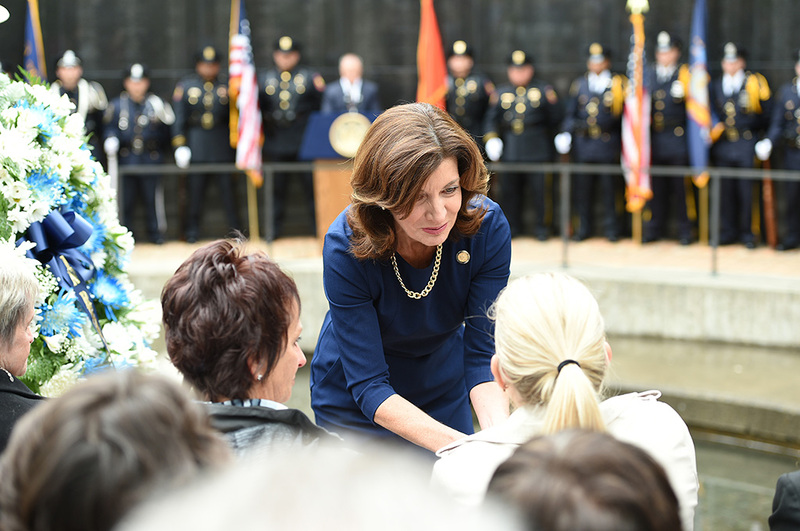 "The names added to the Police Officers Memorial are reminders of the courageous commitment made by the men and women of law enforcement on our behalf, each and every day," Lieutenant Governor Hochul said. "Those we have lost and those who continue to serve with such distinction will never be forgotten, nor will the families of the fallen, who have also sacrificed greatly and to whom we are forever grateful." The names of 38 officers who died from illnesses as a result of time spent doing search and recovery work in the wake of the Sept. 11, 2001, terrorist attack on the World Trade Center also were added to the memorial. The names of officers who died of Ground Zero-related illnesses were first added to the memorial in 2008 and now total 144. Sixty men and women who served with the NYPD and Port Authority Police Department died the day of the attack. 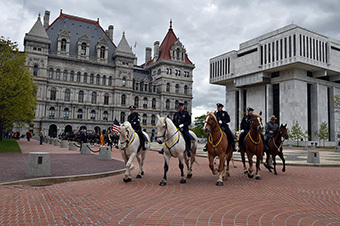 Office of General Services Commissioner RoAnn Destito said, "The New York Police Officers Memorial honors police officers who have sacrificed their lives in the performance of their duty and ensures their courage, dedication, and sacrifices are always remembered. We at OGS are proud to be responsible for the care and maintenance of this special site of remembrance and tribute at the Empire State Plaza. We have recently enhanced the setting of the memorial with lighting, landscaping, and adding granite panels. More work at the memorial, including improving the site’s accessibility, is planned for the future." Michael C. Green, executive deputy commissioner of the New York State Division of Criminal Justice Services, said, "As we remember these brave men and women, we also extend our appreciation and gratitude to their family members and loved ones for the sacrifices they made and the loss they have endured because their loved ones put service above self." The Division of Criminal Justice Services coordinates the ceremony, which was the first since the memorial was expanded with the addition of 10 new panels allowing for 630 names. A second phase of construction, adding a reflecting pond, improved lighting and handicapped accessibility and additional seating at the memorial, also is planned. The total project will cost approximately $1 million and represents the second expansion of the memorial, which was dedicated in 1991. The memorial was based on a design concept suggested by Colleen Dillon Bergman, the daughter of Emerson J. Dillon Jr., a 16-year veteran of the New York State Police killed in the line of duty in 1974. Bergman also suggested the names of fallen law enforcement be placed on the memorial without regard to rank. In a letter to the committee established to oversee the memorial’s creation, she explained: “It doesn’t matter from which department they came, the feeling of loss is experienced the same.” Those words are engraved on the memorial. To be included on the memorial, an individual must have been a police officer as defined in the state’s Criminal Procedure Law or employed as a federal law enforcement officer and performed the same or essentially similar duties as defined in that law. Applications for inclusion on the memorial must be made by the agency that employed the fallen officer. The Police Officers’ Memorial Advisory Committee is chaired by Michael Green, Executive Deputy Commissioner of the New York State Division of Criminal Justice Services and composed of the following members: RoAnn M. Destito, commissioner of the Office of General Services; Margaret E. Ryan, executive director of the New York State Association of Chiefs of Police; Peter R. Kehoe, executive director of the New York State Sheriffs’ Association; Patrick J. Lynch, president of the Patrolmen’s Benevolent Association of the City of New York; Thomas H. Mungeer, president of the Police Benevolent Association of the New York State Troopers; Michael J. Palladino, president of the New York State Association of Police Benevolent Associations; Andrew Rakowsky, chapter president of the Federal Law Enforcement Officers Association; and Richard Wells, president of the Police Conference of New York.